For many, The New Land will be where Jan Troell’s two-part Swedish immigrant story set in 19th-century America really starts to take off. In many ways, The Emigrants [review] was merely preamble to get us here. 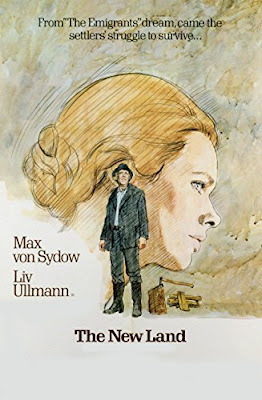 Released in 1972, a year after the previous entry, The New Land picks up the story of the Nilsson family almost immediately after the final scene in The Emigrants. Karl Oskar (Max von Sydow) has claimed a patch of riverside Minnesotan land as his own, and he’s bringing Kristina (Liv Ullman) and the kids, along with his younger brother Robert (Eddie Axberg), to start transforming it into a home and farm. The work will be hard, but it ends up being rewarding, and the Nilssons become part of a growing community of Swedish transplants. Of course, the more people that come from the old country, the more the problems previously left behind that start to catch up with them. Believers in the Orthodox Church, for instance, begin to introduce the same pressure to believe along accepted lines back into the community worship. The new arrivals also start to assimilate well, though not always in the best way. One man takes a Native American as his wife, while also taking on the inherent racism that white Americans felt toward the “savages.” Troell doesn’t layer it on too thick, but he definitely sees the irony in the land of the free that denies freedom to others via the easy adoption of Manifest Destiny. Much of what we see the Nilssons go through is fairly standard for this kind of tale. The building of the farm goes as expected, with the occasional setback, but mostly with positive progress. What sets The New Land apart is the core relationship between Karl Oskar and Kristina, who definitely strain at times to maintain harmony as they grow old together, but who genuinely try to be there for one another. As more kids keep coming, for instance, Kristina has trouble taking her pregnancies to term, and there is much to explore in what that means for their union and also how it tests their faith. Likewise, how that faith changes over time, with the notion that God helps those who help themselves taking precedence over leaving things entirely up to His will. The weird thing about the ongoing additions to the family being so prominent is that Troell never gives any of the children an identity, and it’s never quite clear how many there are. They appear only rarely, and are mostly out of sight throughout The New Land. Troell doesn’t give the kids much thought or importance, which becomes abundantly clear as we see the parents aging at much more rapid pace than their progeny. Over a decade passes in this half of the story, yet none of the kids ever seem to become teenagers who could help work the land, even as their mother and father become stooped and frail. In terms of side characters, Troell is far more interested in Robert and the dysfunctional fraternal relationship between him and Karl Oskar. Midway through the first act, shortly after the farm is on its feet, Robert and his buddy (Pierre Lindstedt) set course for California in search of gold. The younger man returns some years later, looking worse for wear but boasting much success--something Karl Oskar has a hard time believing. Through a set of intriguing flashbacks, Troell shows us the reality of the boy’s journey. These slices are immediately separated in style from the main narrative. There is a minimum of audible dialogue in Robert’s story, the director instead choosing to let music and sound effects take charge of the montage. Rhythmic percussion sets the pace for quickened storytelling, with the oddness of the audio perhaps intended to represent the hearing problems Robert suffers due to a beating he took when he was a farmhand in Sweden. As we discover, the younger brother got a much harsher dose of wilderness living than Karl Oskar, yet he still can’t quite prove himself to the elder sibling. Troell also uses music to underscore some violent sequences in the film, though to a much less convincing effect. The Native Americans pushed out of Minnesota tried to reclaim their land through both legal means and, eventually, force. The preacher Danjel (Allen Edwall) and his family are attacked and killed, and Troell enlists composers Bengt Ernryd (the I am Curious... series) and Georg Oddner to drop a hallucinatory organ dirge on the scene, which creates an odd, dreamlike effect, calling back to a bad vision Kristina had about Native men invading her home earlier in The New Land. The music adds an almost horror-like element to the grisly murders, even as the performances fail the material. Let’s just say the Swedish actors don’t make the most of their death scenes. This violence is followed by a somewhat plodding final act. The breaking of the peace casts a shroud of death over everything, and the Nilssons are pushed along the path to the inevitable. I don’t think Troell intended to juxtapose the heinous retaliation of the American government toward natives with Kristina’s ruined health, or to suggest that her illness is the result of bad karma; rather, it seems he’s intending to convey what a difficult life all the immigrants had chosen, how the conditions were far from the idyll the fanciful reports of the infant country conjured in their minds, but yet perhaps worth the struggle regardless. 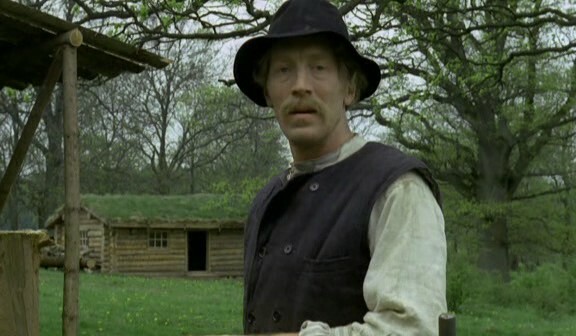 The whole film yellows from this literary jaundice, looking as ill as it did in the seasick portions of The Emigrants. This is maybe the downside of the chosen dramatic structure. As the goal of the characters is to merely keep living, the film can only follow them until they don’t. The movie ends, but it’s a fade out that covers years. Life is nothing if not anticlimactic. Even so, there is still a sense of accomplishment, and the feeling of experience shared. 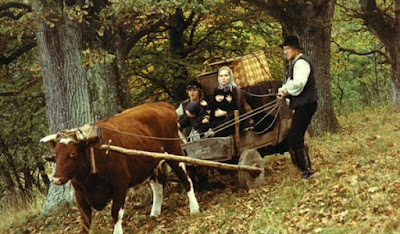 Which is basically what we signed up for when hitting play on The Emigrants and The New Land, so in that, Jan Troell is very successful.